Raise your hand if, as a youth, you ever wrote a letter to yourself, to be opened many years in the future. I know I did. I stumbled upon a blog post entitled Listen to Your Own Advice and loved the idea of the older me writing a letter to a younger me. Just like the Brad Paisley song, “If I could write a letter to me. And send it back in time to myself at 17…” I started thinking about the person that I was 20 years ago, just days before my 16th birthday. You’re about to turn 16 years old! I know it felt like it took forever to make it to 16, but it was worth the wait. In a few days, you’ll go on your first official date (the Homecoming dance is fun, your date is nice enough, but it’s your dress that makes the night!). Enjoy it. In a year you’ll be a high school senior and a year after that, you’ll be on your own at college. Yep, you get into college. I won’t ruin the surprise and tell you where you go to school, but trust me…..you will love it! 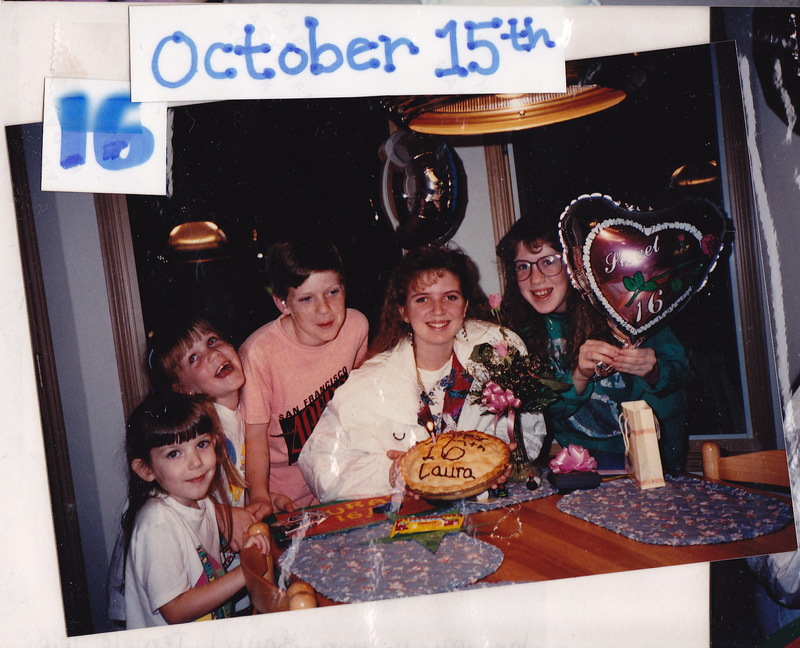 I don’t remember many birthdays specifically, but I remember my 16th. You requested a pie instead of cake (cake just didn’t do it for you) and you took a picture in front of the big kitchen window with your birthday pie. Believe it or not, but that 16th birthday pie started a long-standing tradition of birthday cake alternatives that even your future husband continued for many years. It wasn’t until you perfected baking cakes – and particularly making frosting – and when your kids started making cakes for you that you stopped the birthday pie (or ice cream cake) tradition. Bet you didn’t know that your simple request to mom would make such a difference, did you? That’s the scary thing about being 16. There are so many decisions that seem so small and so inconsequential that eventually have a huge, lasting impact for the future. Thanks for being a good kid. It has certainly made my life at almost-36 a whole lot easier. Can you believe that only 20 years after your 16th birthday you’ve got a teenage daughter yourself? I can hardly believe it myself, and I’ve spent the last 14 years with her, watching her grow. It’s crazy how much your perspective changes once you become a mom. I understand mom and the things she said and did so much better now. I look at the things that meant so much to me….the things that felt like life and death back then, and I chuckle. I’ll give you a little tip. All of the guys that you will come across in high school….as cool as they are, none of them are going to stick around. Just have fun and don’t worry about them so much. Spend your time and your true efforts on the girls friends you’ve made in Portland. They are the ones you will still have contact with years and years down the road. They are the ones that matter. They are good friends. Treat them like the treasure they are. A little word of advice on career paths. Don’t be fooled by all of the fun you’re having working in the counseling office. You do not want to be a counselor. Don’t waste time taking the classes for that degree path. Think about the things that bring you the most joy and focus there. Someday you will discover talents and interests that you never knew existed in you. Amazingly, you haven’t even tapped your potential yet. Keep trying new things and pushing yourself. Don’t limit yourself to the things you’ve always done, or the plans that you think are right for you now. A last word or two, and then I’ll leave you to your birthday and Homecoming preparations: love life. Smile everyday. Hug your siblings more often and find out about them. Learn what makes them tick and develop an individual relationship with each of them. Things change much too quickly, and there’s never (or at least rarely) a chance to go back. What would you say to yourself at 16? i wrote a post to myself a couple of years ago. those are the hardest things to write because of all the honesty that goes into them. I would tell her to get her head out of the clouds and get serious. Beautiful. A great read birthday pie I like it. I am sitting here in tears… partly because this is so touching and partly because the letter I would write to myself would be all about the things I should have done differently. But just as I think of that – if anything had been done differently, I wouldn’t be who I am today, in the life I live and meeting the great people that have surrounded me. It’s so true….as much as we’d love to take back some of the stupid things we’ve done, doing so would make us completely different people. Maybe better….maybe a whole lot weaker.